Discouraged and upset, Susan Jones stopped reading after the first sentence of her admissions letter. She was an honors student and FFA president, with a long list of extracurriculars ranging from softball center fielder to snare drummer in the marching band. CALS had been her goal since sophomore year of high school. Just a few paragraphs down was her ticket to CALS: an invitation to the second-ever class of an innovative new program called “STEAM,” short for Student Transfer Enrollment Advising and Mentoring. The first program of its type at the university, STEAM is an invitation-only alternate admissions pathway for students from rural North Carolina. But Susan was too crushed by that first sentence to keep reading. It was the first in a series of unfortunate miscommunications, each of which came close to toppling Susan’s dream of a CALS education – and the college’s chance to nab a stellar student. Stories from students like Susan have been inspiring change at CALS. Administrators are currently revamping the communications sent during the CALS admissions process to better frame all available paths to CALS. Admissions is broadening its view of what makes a great CALS student to include factors like grit and passion for the field. After her first letter from CALS, Susan began considering other schools. It wasn’t until six weeks later that her mom convinced her to read the rest of the letter. When she got to the invitation to join STEAM, she thought it was a misprint for “STEM,” the educational acronym for “science, technology, engineering and math.” Inspired by two of her FFA teachers, Susan had her heart set on an agricultural education major, not a STEM field. “That’s not for me,” she thought. Luckily, Susan spotted a social media post from a friend excited about his own STEAM acceptance letter. “What’s STEAM?” she texted. Her friend explained. Susan had a decision to make. At first, she was still leaning toward another school. She felt there was a stigma around staying home for a year in rural Sampson County. And she wanted to dive straight into her four-year degree. “But my agriculture adviser said, ‘It’s not where you start, it’s where you finish,’” Susan said. After a summer program on campus and a year at Sampson Community College, Susan is now in her junior year at CALS. She’s a recipient of the Roy R. and Alice Barber Bennett Scholarship and the M.B. “Dutch” Gardner Memorial Scholarship. 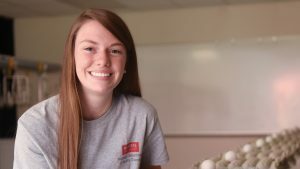 As a member of the CALS Honors Program, she’s planning to research the impact of hands-on learning. 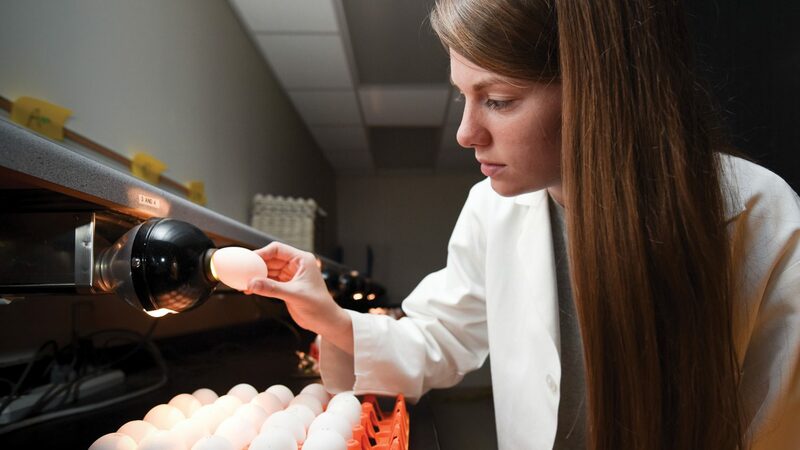 Susan is well-prepared and ready to speak up in class, said poultry science professor Ken Anderson. Outside the classroom, Susan volunteers as a CALS Ambassador, representing CALS students to faculty and alumni – and mentoring prospective students, some of whom have a familiar story.